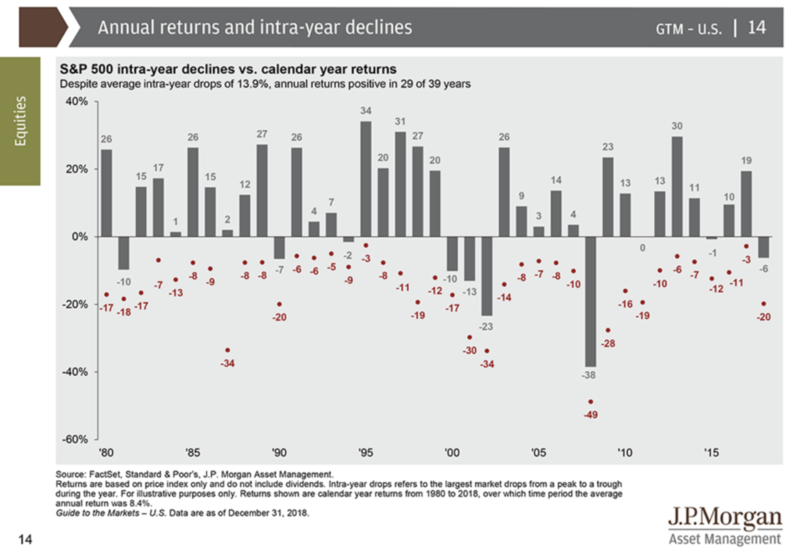 If you look at the chart the red dots below the horizontal line represent the 'intra-year' temporary declines, which tell the story of the declines during each calendar year. You will note that every single year since 1980 (which also happens to be my birth year!) there have been temporary declines of at least -2%, and at most -49%! On average there is a temporary decline of -13.9% during each and every year. On the face of it you would quite likely think that had you invested in the S&P 500 in 1980 you would have had nothing but an up and down roller-coaster and would find yourself in a similar position to how you initially invested, how wrong we would be! 29 of the total 39 years finished with that equity index finishing in a positive position, from +1% to +34%. So how has it faired overall? The returns overall have been very impressive, and will share with you in a moment, but please remember that if you had invested and achieved gains you would have tax to pay and fees and indeed inflation would erode the growth. These 3 factors are far too often forgotten about. Case in point was as individual who mentioned to me recently that they are investing in a fund which is trageted at delivering 4% per year growth. When they take off 2% in fees (it was a retail investment product with saucy fees), 40% tax on growth and say current inflation of 0.5% they are likely, assuming the fund delivers it's (rather pointless) returns, that they stand to gain precisely nothing from the investment, while the product producer/seller will get their 2% every year irresepctive of how it performs! Madness, but that is the prevailing madness of investing in such 'investments'. Anyway, back on point, the S&P 500 index will also generate dividends, unlike the above investment product, so the 8.3% average for that period now becomes 11.1% average growth every year for the 39 years. This point is one that is so often missed when it comes to index investing, the presence of dividends being reinvested automatically, and in this case accounts for 30% of the overall return, certainly something to cherish and recognise as a key driver of returns. Even if the underlying asset say remained unchanged over a 5 year period the likelihood is that the dividends remain paying, and growing for that matter. If you allow for inflation, which in the US over that period of time, ran at an average of 3%, you are achieving a 'real return' of 7.9%. Invest at a total cost of 1% or less, and you all of a sudden have achieved a really solid net return of 7% per year average, which even after tax yer still looking at 5% net real return. Compare that to a fund delivering 4-5% gross return and will not deliver any 'real return' at all after tax, fees and inflation. You pick! So in pounds and shilling terms had you invested €100,000 in 1980 (39 years ago) in that S&P 500 index you'd have a cool €6m now. Damn incredible when you think about it but how many people do you know that have done that?? Exactly, and the reason I believe very few do that is because they don't stay in when the markets have a consistently poor run, such as they did in the 'lost decade' of 2000's. People are far too quick to try and time the markets, and to move out of the 'risky' investment and back into cash until the 'dust settles', or whatever metaphor you wish to use. If you cannot bear to withstand annual TEMPORARY market declines of in and around 14% EVERY year then really you have no place investing in a well diversified quality index of equities, you really don't. If you cannot bear it your behaviour will end up costing you far more than the index can deliver you, because you will not be able to stay in it when it matters, so don't do it, stay away, stick to deposit, because as we have seen a low-volatility fund is as good as useless in real return terms. Oh, there's another chart from JP Morgan report which shows the the average investor has achieved annual returns of 2.6% from 1998 to 2017 while the S&P 500 delivered avearge annual growth of 7.2%! Why the difference you ask, well according to Dalbar who completed this aspect of the research it is solely due to the fact that investors cannot help themselves moving in and out and trying to 'time' the market, and that they have consistently proven that they are as useless as a chocolate fire-guard at doing this effectively, sorry! What Else Does The JP Morgan Report Tell Us? It is utterly off-topic but I am a believer in education, whether it is formal education/qualification or informal education through reading and listening to others I feel it is utterly essential if we want to develop as investors and more importantly as people and humanity. I was really struck to see the following chart in the JP report each quarter....showing the correlation between education and income! I have sought to find an Irish version of such research but have yet to unearth it. Ultimately it is stating that (in USA at least) if you have an 'advanced degree' you will on average earn nearly 3 times the income than a counterpart who has not advanced beyond high-school education. In addition is states that someone with a college degree will earn twice the income of one with a high-school education. Pretty stark right! 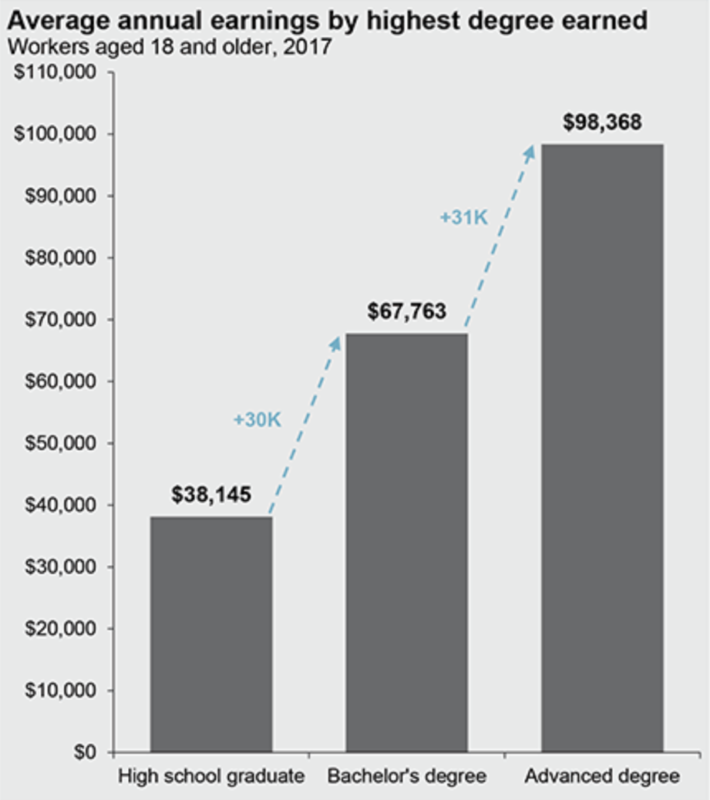 income is not everything but if you are in the education system or if you are a parent to a son or daughter in that system, and they hold income in high importance, then this might be an interesting graph for them to digest and allow focus their mind! Well I'm not really sure what the conclusion is to this piece! I guess it all speaks really clearly for itself, the data is hard to argue with. My intent with this is to make you aware of what you are getting yourself into if you have already invested in equities, with the hope that this knowledge will give you solace when the markets fall 20, 30, 40%, and that it may help you avoid the single most costly mistake that you are ever likely to make.